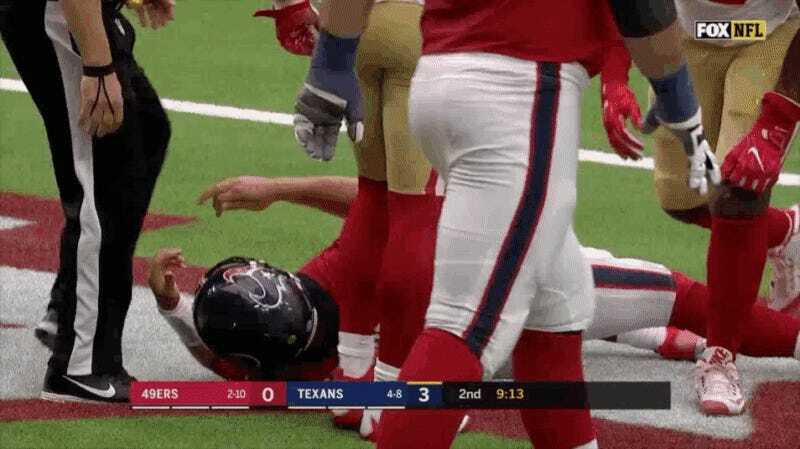 The NFL and the NFLPA completed their inquiry into what happened when Texans quarterback Tom Savage was permitted to re-enter a game earlier this month after smacking his head on the turf and sustaining a brain injury that caused him to experience a fencing response. Their joint conclusion: The concussion protocol was followed properly, but it was inadequate, which is why the league and the union agreed to make subsequent changes to the protocol. No disciplinary action was taken, as a result, because this particularly egregious oversight was somehow no one’s fault. But this explanation doesn’t quite square with what was already in the protocol at the time Savage injured his brain. The review showed that following a hard tackle, Mr. Savage was immediately removed from the game and evaluated for a concussion. The Unaffiliated Neurotrauma Consultant (“UNC”) and team physician reviewed the initial broadcast video, saw the play and Mr. Savage’s response and followed the Protocol by performing a complete sideline concussion evaluation on Mr. Savage, which he passed. The slow-motion video, which focused more directly on the fencing posture, was not broadcast until after the doctors had begun the sideline evaluation and thus was not seen by the medical staff prior to the evaluation. The Texans medical staff continued to monitor Mr. Savage after the initial evaluation and shortly after his return to the game, identified symptoms that had not been present during the sideline evaluation and took him to the locker room for further evaluation. The sentence I bolded above is indeed true: If you watch the real-time video of the play below, you’ll notice that 1 minute, 40 seconds go by between the end of the live play and the first replay that shows Savage’s impact seizure. 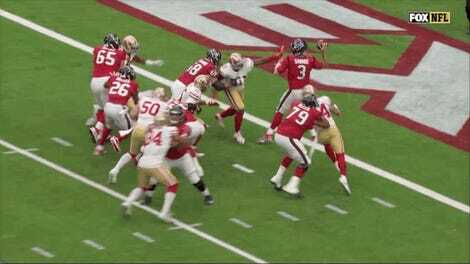 This was because 49ers linebacker Reuben Foster was also injured on the play and Savage—despite his brief reaction—was able to get up and leave the field on his own. It’s also true that, at the 15-second mark, Savage can be seen from behind with his arms in the air, but because his face was not visible and viewers had not yet been privy to a frontal shot of his fencing response, it’s impossible to tell from that angle what was really going on. Two certified athletic trainers (spotters) and two Injury Video Replay System (IVRS) booth techs are assigned to every game. One spotter and one tech are assigned to each team. They have access to broadcast video coming straight from the network feed. There is an IVRS cart on each sideline that shares the feed with that in the booth. Injury video field techs support medical personnel when reviewing injury video. 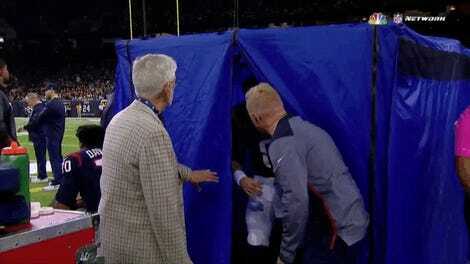 The techs in the booth can play back footage for the sideline medical staff as needed. So: A spotter and a technician are in the booth to view the video. Even allowing for the lag between the end of the play and the first replay that showed Savage’s fencing response, and even allowing for the fact that Savage was immediately evaluated and passed (which can happen), it’s difficult to understand why the spotter and the technician did not alert the medical staff to Savage’s disturbing reaction. The spotters (who don’t work for either team but rather the league) saw the initial feed, which was shared with medical staff on the sideline. Once they saw the replay the doctors were already evaluating Mr. Savage. Video has been used to prompt an evaluation, so the fact that Savage was being evaluated meant the appropriate process was underway and he was being examined by the doctors. As you may remember, the slow-motion replay of Savage’s response came much later during the replay of the sequence of events. TV was initially focused on the injury to a 49ers player and then aired the Savage response while the medical staff and UNC were already evaluating him. That the league and the union both acknowledge the outcome here was unacceptable is indeed a step forward; it’s a far cry from where we were in September 2016, when the entire world watched Cam Newton’s brain get repeatedly bashed in, only to have the subsequent league-union joint investigation conclude that everything was fine because the medical staff somehow evaluated Newton from the sideline and concluded he was okay. But in Newton’s case, a similar breakdown in communication between the spotters and the medical staff was likewise shrugged off. Then, we were told, the unaffiliated spotter’s responsibilities ended once he or she made initial contact with the medical staff. Now, we’re being told, the spotter’s responsibilities ended once Savage was being evaluated. The recent changes to the protocol, as McCarthy’s response to me makes clear, are an attempt to address perceived loopholes in procedure—e.g., that the fencing response (or something similar) requires removal from the game without returning, and that a centralized UNC can assist the spotters and techs with reviewing the broadcast footage. These changes really are improvements, and last weekend was proof that the protocol can work. But these guidelines will only truly have teeth when the league and the NFLPA insist on enforcing them, as they did when the Seahawks flouted the protocol last month with a star player like Russell Wilson. That said, it’s also hard not to feel the protocol provides a way for the league to use an independent third party—like the spotters and the UNCs—to avoid holding anyone accountable.